Gilera is one of the Antichi Marchi Italian's still producing motorcycles, founded byGiuseppe Gilera in 1909 opening its small workshop in Milan and subsequently a factory in Arcore, in provincia di Monza. The first motion to carry this name was VT 317 . After the first world war, Gilera centimeter cc piston displacement produces motion from 500 and begins with these to participate and to win in the most prestigious international competitions of the time. This motor from 500 cc had the lateral valves, in 1930 Gilera begins to use valves in head. The Four Bolts 500 and Eight Bolts are born. In the 1936, leaving from a plan of roman house CNA Rondine, Gilera introduced omonima the motion endowed of a four cylinders online from 500 cc equipped of compressor that established the new World-wide Record of the hour (to 274,181 Km/h, established record in 1937) and conquered the bay one in the European Championship of the 1939. 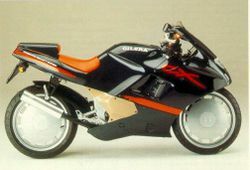 Also for Gilera, like for all the constructors of motion of the age, the second world war interrupts every activity. In the immediate Gilera post-war period it introduces an other of its models enters to you in the history: Saturno 500 . The range comes completed with various small motion and average rolled. Between 1950 and 1957 the Gilera won, with a perfected version and without compressor of the 4 cylinders of pre-war, very six Sample World-wide pilots to you with Umberto Masetti, Geoff Duke and Free Freed, six Titles of Manifacturing Champion of the World, three Tourist Trophy, seven Sample Italian and one to you Milan-Taranto. 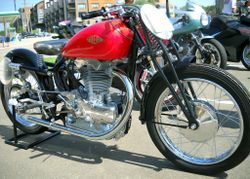 But the increasing costs and the first skirmishes of the crisis that of them to little years invested the comparto motorcycle, had to the outbreak of the automotive market, it made yes that Gilera decided in 1957 the withdrawal from the competitions, of common agreement with Motion Guzzi and Mondial. 1960 remembered the Giubileo , Red , Tourism and Sport that they obtain succeeded bonds trades them, with to renewed the 300 Saturno and the Bicylindrical . Laughed them to 1969 the acquisition of Gilera from part of the Group Piaggio. The new property carries out important investments on all the range, above all centralized the fuoristrada activities that they had already given lustro and Gloria to the Lombardic House (numerous the victories in the Six Days International). The 125 Bicylindrical Cross of is the most famous example. 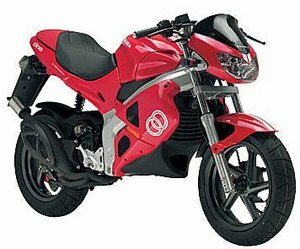 In the field of the motorcycles from road it comes instead introduced the Gilera Arcore available in two piston displacements from 125 and 150 cc. We arrive therefore to anni eighty, when Gilera introduces one new series of motors to 4 times, bi-4, single cylinder and the bitree, in the piston displacements of 350 cc and 500 cc (later on carried to 558 cc). These motors from the production came use you also for the motion enduro from competition, the RC 600 and RC 750 , victorious in two Paris-Dakar (victories of class) and in a Rally of the Pharaohs (Victoria absolute). In the 1991 it is born the Nordwest , available in piston displacements 350 and 600cc, innovative motion and antesignana of it puts into effect them supermotard, but that he collects little happened although goes interesting guidabilità and performances to you, joined to the reliability of bi-4 the Gilera. Also other motion from road endures a remarkable technological impulse, and is born the SP02 and futuristic the CX125 , futuristic in the design but remembered above all for the front staple monoarm. In 1993 the bitter closing of the plant of Arcore, necessary to the control of the costs in a market that less and less rewarded the Gilera. All the production comes transferred near the parent company to Pontedera, at the same time is attempted to diversify to the production introducing a range of scooter, necessarily sportswomen as the Gilera brand demands. The Gilera Runner (50 cc, 125 cc, 180 cc and 200 cc, is 2 that 4 times) of are more fulgido the example. The happened one of the range scooter will carry but like necessary contropartita the definitive escape of the Gilera brand from the motorcycles. But the gene of the innovation in spite of everything is not extinguished and just from Gilera happening like the DNA , one via of means between one true motion and one are born new ideas of discreet scooter. To the Hall of Milan of the 2003, Gilera introduces the Iron , from the design appreciated but above all contraddistinta from a true automatic gearshift. The one which had to be first “automatic motion” of it was modern (not before in absolute, remembers the Motion Guzzi V1000 succeeding Idroconvert of the 1971 of good) remained but only a beautiful prototype having had then a continuation does not trade them. 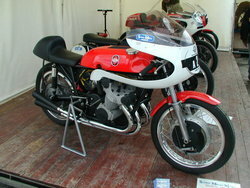 In the competitions, after one fugace apparition in Campionato 250 cc in 1992 - 1993, Gilera ripresenta in the 2001. The motion class 125 was not planned inside but it was the evolution of the Derbi from Great Prize, arrived inside of the Piaggio Group as a result of the acquisition of the Spanish house. Gilera returns to enroll just the name in the history of the competitions winning in 2001 World-wide Championship 125 with pilot sammarinese Manuel Rests them. In a 2004 still innovative product it arrives on the market, one scooter of 500 cc of piston displacement from the particularly sport temperament with one adjustable posterior suspension, Nexus 500 .